You’ll find that many sweater patterns are knit in pieces from the bottom up. Most of these patterns instruct you to start knitting the body first and then move onto the sleeves. Recently when I cast on for the Playful Stripes Sweater, it wasn’t until I was nearly done with the body that I wished I had started knitting the sleeves first. I was straying from the pattern and trying a different cast on method. It would have been easier to test the cast on with only 38 sleeve stitches compared to the 144 body stitches. There are a few reasons you might want to start with a smaller number of stitches on a sleeve before knitting the body. 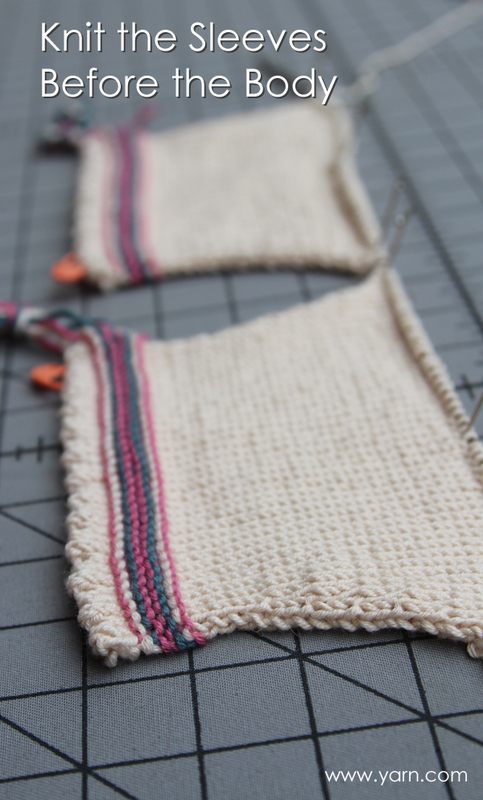 Hate swatching so a sleeve essentially becomes your swatch so you know if you’re using the right needle size. If I was going to start my sweater over, I probably would have done something a little differently on the cuffs and hem. It wasn’t until I was too far into the body that I realized I wanted something different. But I felt I was too far along to make it worth ripping out and starting over. But if I had started with a sleeve first…I wouldn’t have hesitated to start over and get the cuff/hem I really wanted. Live and learn. Are you a strict pattern follower? Or do like to use a pattern as your guide and change things up a bit? If you’ve been following along with our 31 Days to Get Organized blog series, your knitting and crochet life probably looks a little more organized than it did a month ago. But many of you have found that you can put in a lot of time and effort getting organized, but it all falls apart after awhile. The last key part of any organizational system you create is maintaining the organization. Today’s task is to look back at how your craft organization has fallen apart in the past and how you will be able to carve out time to maintain your knitting and crochet organization going forward. Find a home for new yarn, patterns, and tools as they come into your home. We all have busy lives and would rather be spending more of our time knitting and crochet. But I’ve found that one of the easiest ways to stay on top of a newly organized system is to find a place to store everything as it comes into your life. Decide where the new yarn will live. Put away patterns, magazines, and books with the rest of your collection. That means digital patterns too – move the file to the correct place on your computer where you can find it easily later. Dealing with the new items right away keeps them from piling up and getting overwhelming. If you like to keep track of what’s in your yarn stash, pattern library, and needle and hook inventory, enter your new items into your tracking systems before you put each item away in their new homes. The last part of finishing a project shouldn’t be weaving in your ends or blocking it. Document all of your hard work. Take pictures of your finished project including close up shots of details. And type up notes about your project right after finishing when it’s still fresh in your brain. What changes did you make to the pattern? How much yarn did you use? What needle or hook sizes did you use? Who did you make it for? 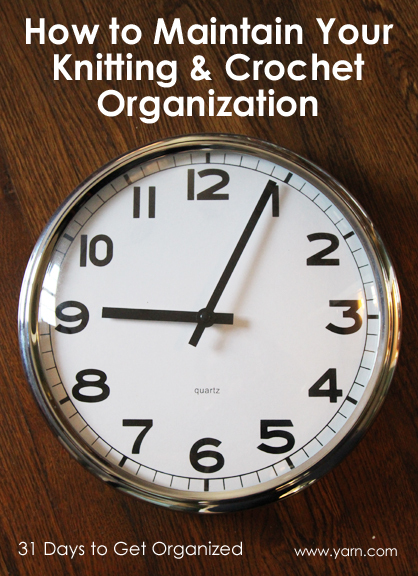 Schedule tune-ups for your organizing system. Depending on how quickly yarn and patterns come in and out of your house, schedule regular tune-ups where you go through your yarn, patterns, and tools and clean them up, getting rid of the stuff you no longer want, and re-organizing if necessary. This may need to be a monthly, seasonal, or yearly task for you. I find that if I put these tune-ups on my calendar, they’re more likely to get done. I also like to make a list of priority projects that I want to knit and crochet. This includes making gifts for birthdays, holidays, new babies, etc. I’ll take a look at my calendar and schedule them throughout the year so I can stay on top of these time-sensitive projects. Writing down all of these projects also helps me look at if my expectations for what I want to do are actually realistic. Often I want to make a lot more things than I really have time to do. If you’re having a hard time fitting in enough knitting and crochet time, think about how you can use the wasted bits of time during a week. You can find that knitting and crocheting on the go may add up to a lot of time by the end of the week. Also, if you have some projects coming up that you need to finish, think about scheduling a knitting and crochet vacation for yourself. Carve out an afternoon or a weekend at home (or away) where you can focus your time on your project. 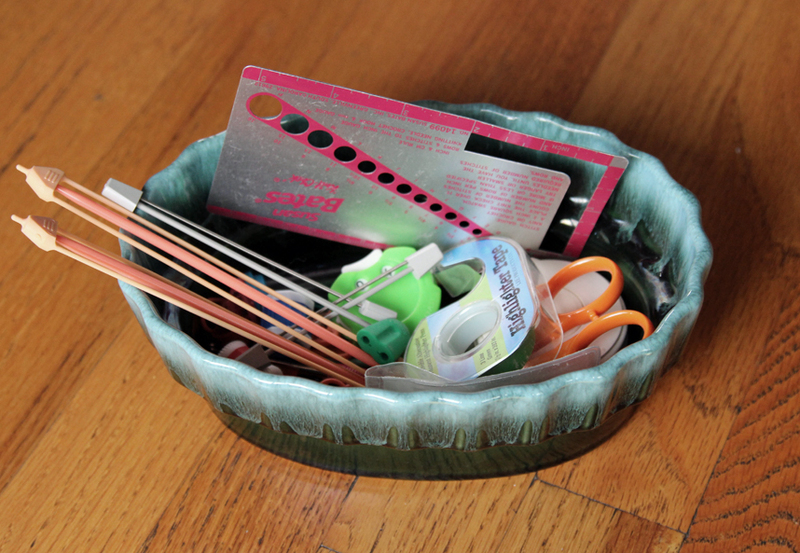 Do you find it difficult to keep up your knitting and crochet organization once it’s in place? How do you fit in all of the knitting and crochet time you want? If you’ve been knitting and crocheting for more than a few years, you might have a quite a collection of finished projects by now. Some of you have asked for help on how to store your finished projects, especially if you have big collections of sweaters, accessories, and such. In today’s 31 Days to Get Organized post, we’ll be talking about caring for your handmade garments, tips on how to organize and store them, and how to reduce your collection. The first thing you want to do is make sure your handmade creation is clean before you put it away for an extended time. Dirt will attract critters, so you’ll want to make sure your handknit sweater or crocheted blanket is clean. Follow the care instructions for the yarn you used. Eucalan Wool Wash is great for natural fibers, and some scents have natural moth and flea inhibiting properties. Remove pills that may have developed. Using a tool like a sweater comb or the Gleener Ultimate Fuzz Remover will make quick work of this task. Also repair any holes, seams, or loose ends showing on the right side of your fabric. This may take a little more time, but you’ll be thankful when you pull it out to use the next time. Don’t hang your sweaters. This will cause them to stretch out and get hanger marks over time. It’s better to fold or roll your sweaters and store in drawers or on shelves. 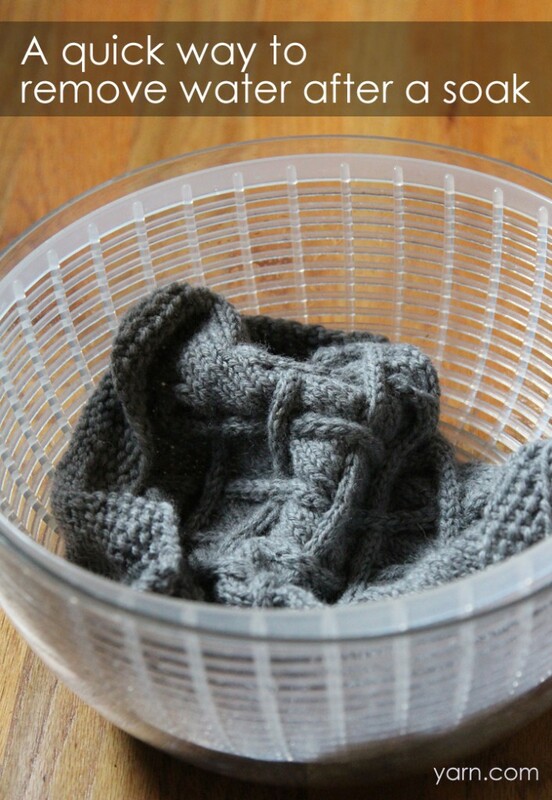 If you store your sweaters in drawers, rather than folding and stacking them, roll them after folding in the sleeves. All of your sweaters will be more visible and not hide in the bottom of the drawer. If you have wide shelves, use shelf dividers to separate your piles of sweaters so they stay neater and don’t fall over. Keep similar gauge sweaters together. Don’t stack heavier or bulky sweaters on top of fine-gauge sweaters. If you have a lot of hats, mittens, scarves, and other accessories, sort them into individual containers to make it easier to find what you’re looking for. A basket of scarves, bucket of hats, and box of mittens can save you time when you’re rushing to get out the door in the morning. Clear plastic drawers that sit below coats in a closet is a good use of space. Use a storage solution where you can easily see your collection. Shallow boxes on a shelf, a shoe organizer with clear pockets on the back of a coat closet door, or open wire baskets attached to the wall can make finding things easier. 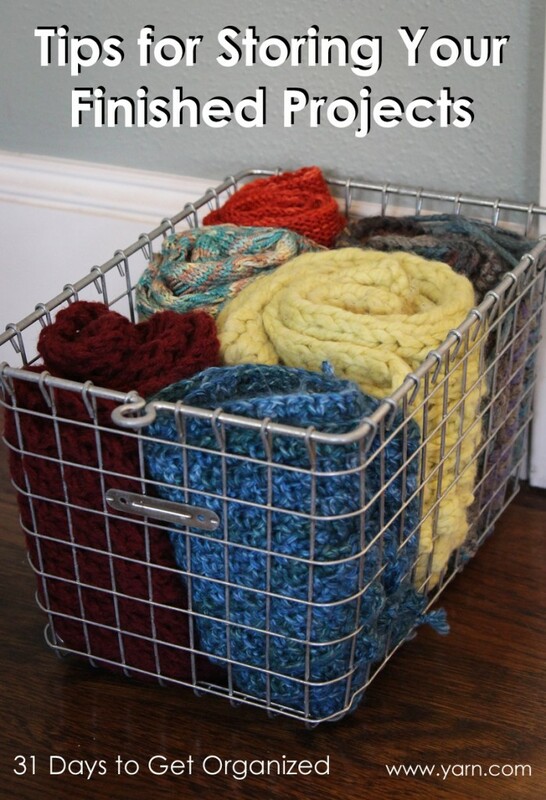 Some of your storage can also be a way to display your knitting and crochet work. Show off your felted bag collection on wall hooks, or hang your favorite shawls and scarves on a towel rack for all to see. Check out our Craft Spaces Pinterest board for more storage ideas. What if your collection has gotten too big for your space? Rotate through your garments, keeping some in deeper storage and the rest more accesible. Weed out the items you no longer wear or use. Find another home for them or put them in your giveaway pile. But take pictures first of your work if you haven’t done so already. Sometimes when you finish a project, it doesn’t turn out like you wanted it to. Don’t get frustrated. Save it for your next yarn swap and include a finished project swap too! Do you have any other tips for storing and organizing your finished work? If you’ve been following along with our 31 Days to Get Organized series, today’s task may be a nice change of pace. We’re going to spruce up our primary knitting and crochet spaces at home. One of the beauties of knitting and crochet is that you can do it anywhere. It’s a wonderfully portable activity. Despite that, many of us do most of our knitting and crochet at home. And you probably have only one or two main places that you do the bulk of your work. Maybe it’s a favorite chair in your living room, knitting or crocheting while you watch t.v. Or you might have a corner in a sunny part of the house with great light. Or you may be fortunate enough to have a whole room just for your crafts where you can really spread out. – Do you have adequate light to see your work easily? – Do you have enough nearby storage for the things you use frequently? – Is it a comfortable place to sit for an extended time? – Do you have enough horizontal space to spread out if necessary? – When you look at the space, how does it make you feel? Happy, overwhelmed, excited? – Do you prefer to work away from the everyday hubbub, or do you like to be in the middle of the action? Ideally, you want to create a workspace that is comfortable and inviting. To improve your space you might need to change it’s location, rearrange some furniture, or simply get a brighter lightbulb. If you’ve been watching our organizing thread on Ravelry, you’ll have seen jbtraveler‘s before and after photos of her knitting space. She didn’t make drastic changes to her space, but enough small changes that makes it more functional and enjoyable place to work. I love seeing everyone’s progress. If you’re looking for more inspiration for your knitting and crochet spaces at home, check out our Craft Spaces Pinterest board for more ideas. Where is your favorite place to knit and crochet at home? Welcome to the last week of our 31 Days to Get Organized blog series. We’ve all put in a lot of work to get our knitting and crochet yarn, patterns, needles, and hooks organized. We’re in the home stretch now though. 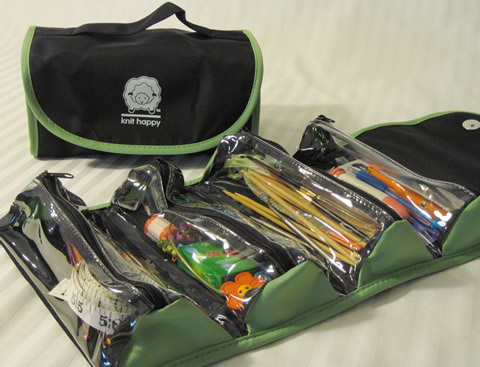 Yesterday we gave you a look inside our knitting and crochet tool kits. Today’s organizing task is a simple one. 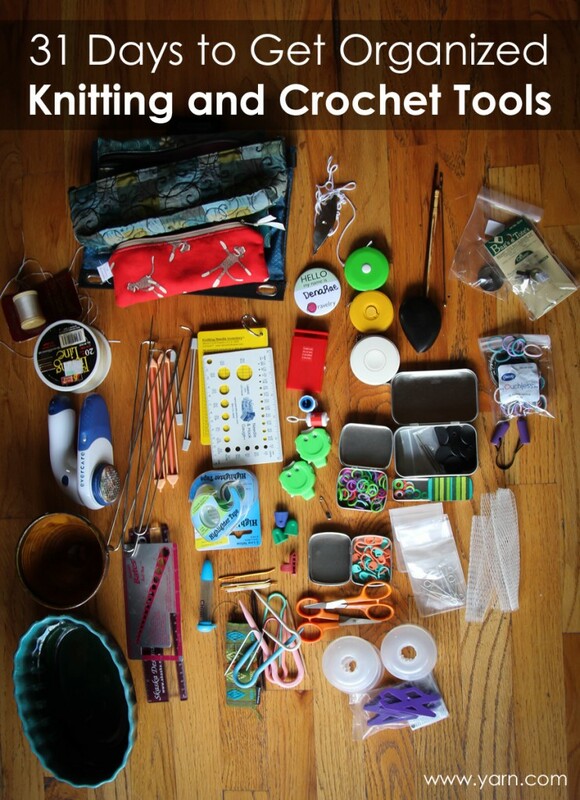 Collect all of the knitting and crochet tools you can find. Gather all of your stitch markers, cable needles, stitch holders, tape measures, needle and hook gauges, darning needles, craft scissors – all those little tools that we use to help us with our knitting and crochet projects. This might require you to dig through your project bags, sofa cushions, junk drawer, car glove box…all those places these little things start to collect and hide. Of course grab your tool kits too. 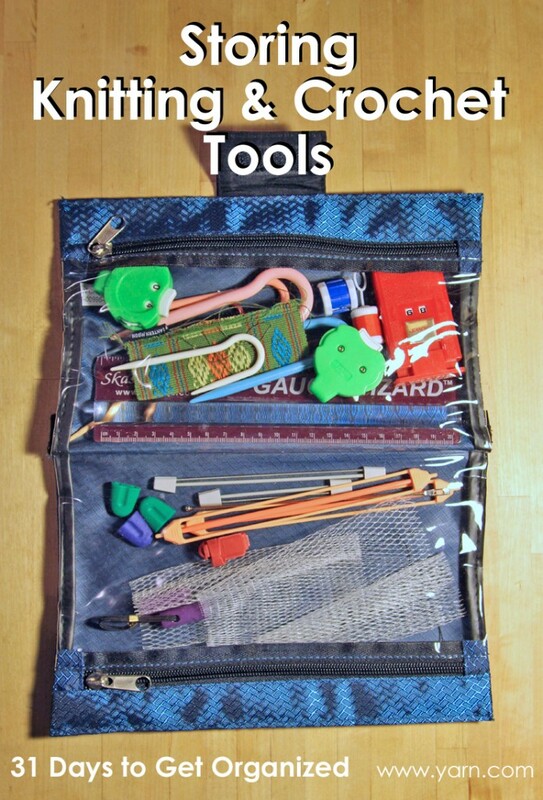 Now that you’ve collected all of your tools in one place, spread them out and sort them. You’ll start to notice duplicate items and maybe some things you never use. This is a good time to weed out any of the tools you don’t want or need. Add them to your giveaway pile of yarn and patterns if you haven’t gotten rid of them yet. Tomorrow we’ll be talking about different ways to organize and store your knitting and crochet tools. Since we’ll be wrapping up organizing our knitting and crochet this next week, what organizing questions or dilemas do you still have that we haven’t covered already? Leave your question in the comments so we can address as many as we can before wrapping up the series on Friday. Many of you have discovered that Ravelry works really well for keeping track of your pattern library. This is especially true if most of the books, magazines, and patterns that you have in your library are from the recent past. 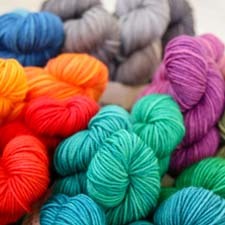 Patterns are added to Ravelry by members. There are almost 340,000 individual knitting and crochet patterns on Ravelry! And over time, more and more older patterns are being added to Ravelry in addition to most new ones. But what if you don’t use Ravelry or have A LOT of older patterns in your library that don’t exist on Ravelry yet. You may be looking for an alternate solution for keeping track of what you have in your library. During this blog series, people have been raving about Evernote in the comments. 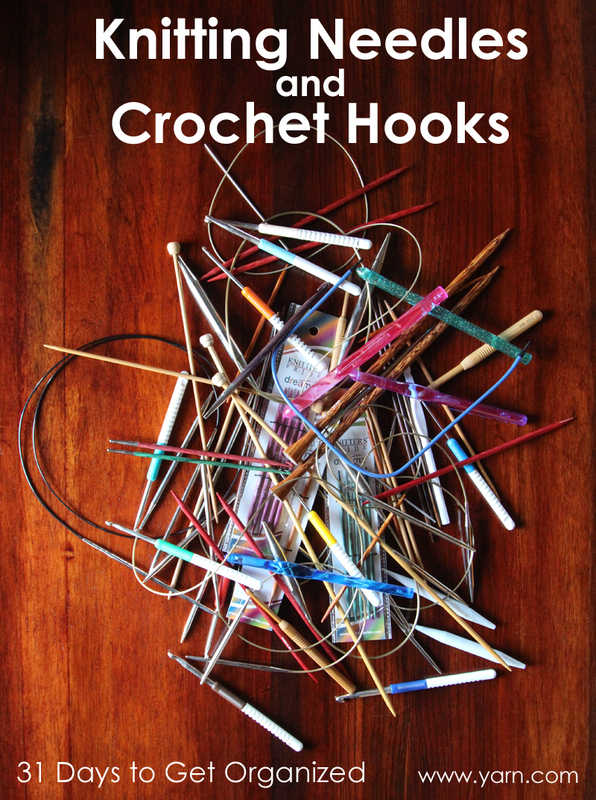 It sounds like it’s an easy way to keep track of all of your knitting and crochet life, including what patterns you own. Because there are Evernote apps available for you mobile device, you can have access to it anywhere. If you’re interested in learning more about Evernote, check out this blog post, Evernote for Knitting: How Jennifer Lathrop Keeps Her Patterns and Needles Organized. Don’t worry, it applies to crocheting too. I used to use Delicious Library to catalog our music and books. This allows you to upload your media to your library by scanning the barcodes. It’s easy to use, and may be a good option if you just want a list of all of your knitting and crochet books, but it won’t let you organize the individual patterns from the books. One question to ask yourself is WHY you want to keep track of all of your patterns. Do you get frustrated looking for just the right pattern, or find it takes a long time to find the specific pattern you’re looking for? Then coming up with some kind of tracking system might make sense for you. Maybe you mostly find that you’re always searching for a new baby project, but not much else. It’s perfectly reasonable to go through your collection and just catalog the baby patterns you have in your library. This may be a good tip for someone who is overwhelmed by the size of their library, and can’t imagine cataloging everything, thus keeping them from even starting. No matter what way you use to keep track of your pattern library, don’t feel compelled to enter every pattern you own. I’m a type ‘A’ person, so sometimes I want to track everything, even though I don’t need to track it all. I would recommend tracking only the patterns you actually want to make someday. Don’t feel compelled to list every pattern from a book or magazine. That takes a lot of time. And wouldn’t you rather be spending some of that time knitting and crocheting? So, do you prefer to flip through your books and magazines to find your next pattern to knit or crochet? Or do you prefer to catalog every pattern and have access to your whole library when you’re out shopping at your local yarn store?